I in my day off in Hong Kong. It’s a Chinese holiday, and I’m fighting to get the final proof done on Redefining Literacy 2.0 before I get busy again. Today may be my last day off in weeks. …we need to quit looking at tools and saying, ?How can I make this educational? ?, we need to look at an educational need and say, ?What tool that exists can fill this need?? or ?What needs to be built to fit this need?? So many posts about, ?trying to figure out how to get twitter into the classroom.? Don?t try to cram every cool new technology into the classroom ? it?s bad for our cause! This is so very true. It doesn’t mean that we should avoid paying attention to these things, and playing them ourselves. I think that it is important for us to understand these experiences and what and how our students are learning in them — even if they are not part of the st-st-st-standards. Humanities, Arts, Science, and Technology Advanced Collaboratory. Now that’s a mouthful. I know they’ve passed through my radar, but rereading their description, I don’t know why they are not one of my regular stops. A consortium of humanists, artists, scientists, and engineers, of leading researchers and nonprofit research institutions, HASTAC (“Haystack”) is committed to new forms of collaboration across communities and disciplines fostered by creative uses of technology. Our primary members are universities, supercomputing centers, grid and teragrid associations, humanities institutes, museums, libraries, and other civic institutions. 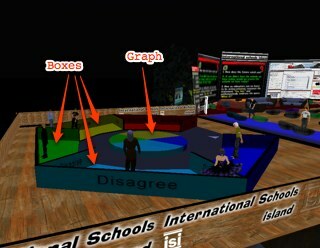 Since 2003, we have been developing tools for multimedia archiving and social interaction, gaming environments for teaching, innovative educational programs in information science and information studies, virtual museums, and other digital projects. I’m especially intrigued by the Young Innovators theme. Young Innovator awards are targeted specifically to innovators aged 18-25. These awards will support smaller-scale, forward-thinking, conceptually exciting and original participatory learning projects. The aim of this category is to encourage young innovators to think boldly about ?what comes next? in participatory learning and to contribute to making it happen. These awards are designed to support young innovators in bringing their most visionary ideas from the ?garage? stage to implementation. I feel like we are missing some opportunities in that we are not leveraging the young teachers who are just coming into the profession. 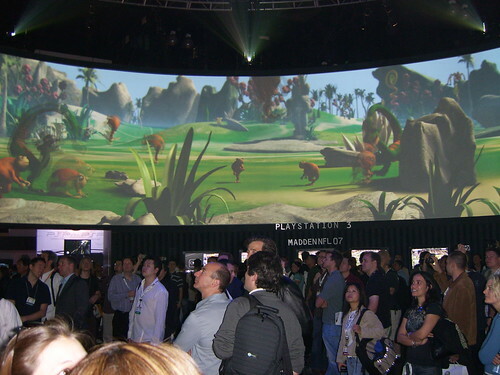 Many of them have extensive experience with participatory technologies. Yet the connection between those experiences and teaching and learning are apparently not automatic. I would love to see schools or universities support young teachers in designing and building new collaborative applications — and this competition may be one way of doing that. This morning I will be working for the ThinkQuest International Partner, the College of Continuing Education, Hong Kong University of Science & Technology, delivering a keynote for the ThinkQuest awards event. If you are a regular reader of this blog, then you know what an honor this is for me. The box to the right is an RSS listing of 2¢ Worth blog posts that mention ThinkQuest. I suspect that no other single experience has impacted so much on my philosopies about education today. I would ask the audience to fold the piece of paper, slip it into their pocket book or walet, so that they would run across it at some point after the presentation. Then I asked that they take a minute, upon running across the paper, and reflect on the implications to teaching and learning. 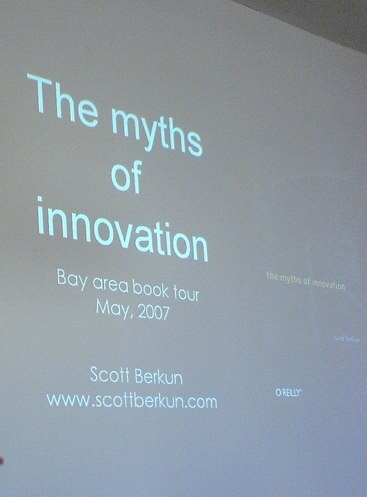 It seemed outrageous at that time, it’s ligitimacy coming only from the reputation of the MIT Media Lab’s director and chief evangelist. I don’t know what the numbers ended out being by 2000, but the impact of that quote and teachers’ reflection on the prediction have certainly born out. Anyway, wish me luck on the speech. I think I also have to stay behind the lecturn. Yikes! In a couple of hours, I’ll fly on to Hong Kong, where I’ll work with the Chinese International School and a couple of other engagements over the next few days, including their ThinkQuest event. I’ll probably have more to say about that later. After HK, it’s back to Shanghai for the Learning 2.008 conference. I’m pretty sure it’s going to be one of the most interesting conferences that I’ve been a part of. Although there will be presentations, the gathering will be mostly about conversations. We’ll be a negotiating words, looking for language, and painting a new image of teaching, learning, and the contexts for education that are relevant to this time — and compelling for today’s ears. We’re seeking a new story. How does the future catch you? If we didn?t have the schools we have today, would we create the schools we have today? Of course, I’ve got my own various lenses for interpreting these questions and suggesting answers. But I also know that there is not one single avenue for exploring the questions, nor are there simple, consistent answers. I’ve talked about some of the questions here and on the conference social network. But with only a few days before the conference, I’d like to listen a bit more. So how would you answer these questions? Which, of the dozen or so questions here, are the most important? A few years ago, Constance Steinkuehler — a game academic at the University of Wisconsin — was spending 12 hours a day playing Lineage , the online world game. She was, as she puts it, a “siege princess,” running 150-person raids on hellishly difficult bosses. Most of her guild members were teenage boys. 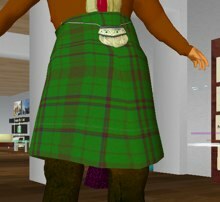 Meeting Ewan McIntosh again yesterday, this time in Second Life?, I wanted to pay tribute to his home and heritage, by wearing a kilt. It’s not an article of clothing that I really understood, until going to Scotland and seeing big brawny men playing really loud bagpipes — in kilts and knee socks. 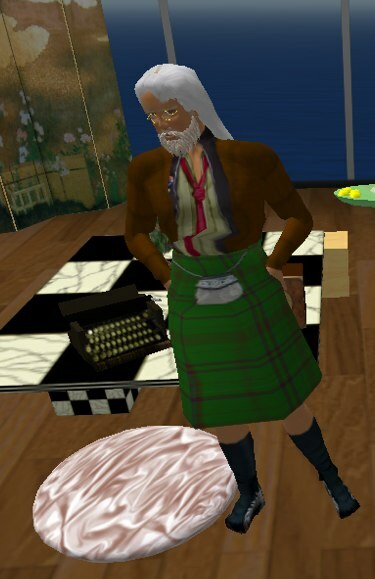 Anyway, I shopped around in Second Life for some free kilts and didn’t find any for less than the L$188 I had left. So I tried making my own, using the SL Appearance tool and came up with nothing that I was satisfied with. So I decided to take a stab at making my own kilt. Anyway, I found a tutorial, downloaded some templates and set to work. 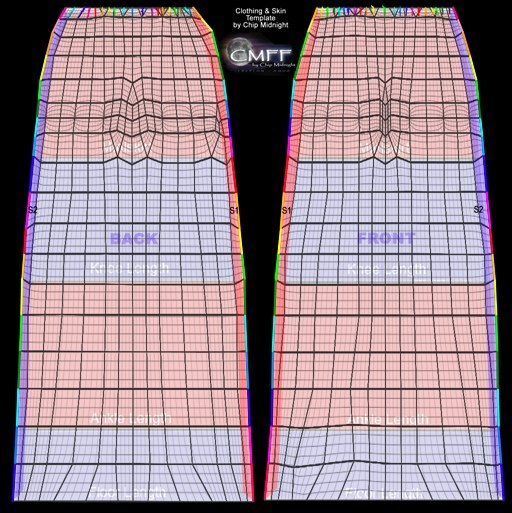 I downloaded the template file, a zipped folder with several files, including one for a skirt (see figure 1). The templates are PSD files. So you have to have Photoshop or Photoshop Elements, or some other graphics program that will edit PSD files. 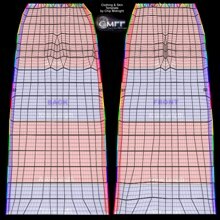 Basically, you draw or paste what you want in the back (left) and front (right) of the skirt within the template lines. 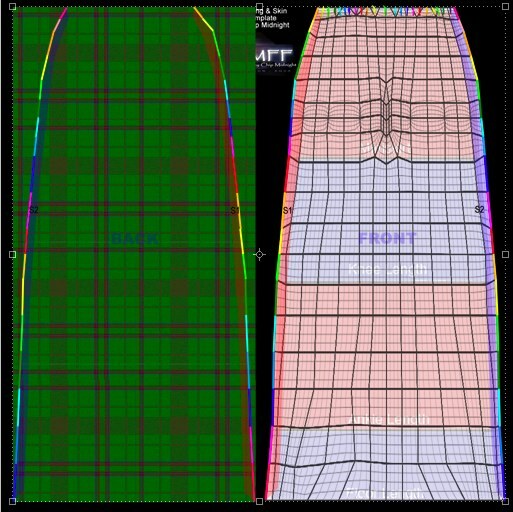 I found the O’Brien tartan on the web, downloaded the image and then sized it over the templates as additional layers. (see figure 2) You can then elevate the outline layer on top of the fabric and cut away the extra material, so to speak, using the polygonal lasso tool. I guess it’s a lot like making real clothes. 3. For the sporran, the purse worn in the front of the kilt, I went to Flickr and did a creative commons search, finding a photo of the Northern Constabulary Pipe Band, with a very clear view of a Sporran. ((Conner, Dave. “Northern Constabulary Pipe Band – Bass Section.” Conner395’s Photostream. 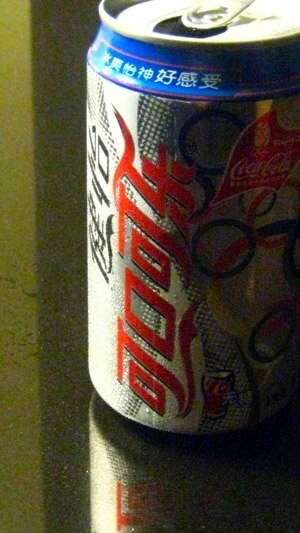 19 Jun 2007. 8 Sep 2008 <http://flickr.com/photos/conner395/571507480/>. )) I took the photo to my images folder and then into Photoshop Elements to cut out the purse (see Figure 3). 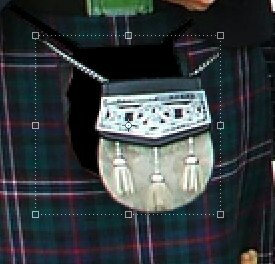 Then moved the purse onto the kilt image, positioning it over the front side (right). Finally, I saved the file as a jpeg and then went to Second Life to import the skirt. 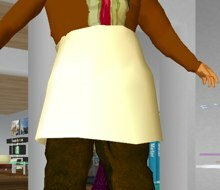 From Second Life, I went to the privacy of my office, and uploaded the skirt (File/Upload Inage). It costs L$10 (Lindens) to upload. When it’s uploaded, you go to appearance (right-click on myself and select [Appearance]). Then I clicked [Skirt] and the button indicating that I want to create a new skirt. After finishing the kilt, and can remove my levis — best done in that order (see figure 6). Now there are two points to this blog article. One is that I learned something new. Between not knowing how to make clothes in Second Life and knowing how, there is a wall. You can’t see through it from the side of not knowing, and it appears to be a high and impenetrable barrier. However, once attempted, using basic search and evaluation skills, I was able to easily find instructions. If I’d wanted, I could have searched for and chosen from 23 video tutorials from Youtube. Getting on the other side of that wall and looking back through the transparent side is what we all need to have the courage to do and demonstrate that courage to our students. The other day, I was talking with a grad student in New York, who was working in a project to create a Rembrandt world in Second Life, where visitors could view the works within the context of the artist’s world. She commented that they hoped to find someone would would make period costumes for free. 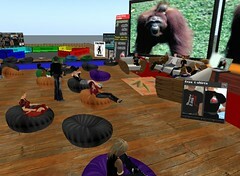 I just backed out of Second Life for the second Preconference conversation, precursoring the Learning 2.008 conference in Shanghai later this month. The two invited speakers this time were myself, Suriawang, and Scottish educator, Ewan McIntosh (Learning Loon). The first bit of disappointing news was that Marco Torrez and George Siemens will not be able to join us. This is a huge disappointment, because each of them would have added so much to my experience. The good news was that the conference sessions will be available the first of the week, so I’ll know how to prepare. Half of the sessions will be formal presentation and the other half will be unconference sessions. Again, I’m looking forward to the learning that I will certainly be doing as a result of all those conversations. McIntosh also took exception to the emphasis that we, many of us, are placing on collaboration — and I agree with his notion that we shouldn’t throw out the value of individual insight and creativity, to follow the trumpet call to collaboration. I think it is one of the weaknesses of todays digital conversation, that our statements tend to be chirps about this and chirps about that — and as a reader reads one blog post about the importance of the creative arts, it can sounds in opposition to science and math. This is probably a good thing, in the long run, because it has us constantly struggling to find the middle ground, the blend between collaboration and individual, science and art, lecture and self-directed learning, and all of the other spectrums. After the formal conversation was over, Chris Smith, one of the moderators and the architect of International School Island, took us over to a device called the Opinionator. Please correct me, Chris, if I got the title wrong. In a circle, there are five containers that a person/avatar can walk into. They are labled agree, strongly aggree, disagree, and so on. The question is asked, and the participants walk into the container that corresponds with their answer. The pie chart in the middle rebuilds itself in real time, to reflect the percentage of users who are of each answer. I find this terribly exciting, that we are in a place where we are inventing new tools, capitalizing on new environments. Terribly exciting. I’m home for six days, sixteen hours, and some change, and I’m so switched off that I just can’t get to some serious things that I’d shoved over to this seemingly mythical time at home. Mostly, I’ve been playing. Yesterday I replaced the theme of my blog, because when I saw it pulled up on a PC the other day, it looked nasty. So I started simple, with the WordPress “classic” theme, and then fleshed out the CSS file. What do you think? Today, I’m hunting for a wiki engine to replace PMWiki. I’m still very happy with PM, but its wiki-style code editing intimidates audiences when I demonstrate how my handouts are editable. So I’m looking for a new engine with WYSIWYG editing, will aggregate RSS feeds, and has an editable skin. So far no luck. I’ve played with Dokuwiki, and Wikiwig, and am currently uploading WackoWiki. If this doesn’t work, I’ll take another look at Wikispaces and WetPaint. One interesting thing came across my desk yesterday. While at Elwood, NY earlier this week (seems like weeks ago), Patti Novy, of eInstruction? brought in about 300 clickers for teachers to use during the convocation. The superintendent posed some questions during his part, and then I added some questions as a lead-in to my presentation. Patti sent me the data yesterday, and some of the results were quite interesting to me, now having time to reflect on them. No real surprise here. A lot of the educators in my audiences are young, and I continually run into more experienced teachers who are enthusiastic gamers. Do you text message with your phone? This is one of those Twitter type questions. People who do it can’t see how they got along with out it. Those who don’t, can’t see any reason to start. Do you have a Facebook or MySpace page? I wonder if the response would have been different if I’d asked for a show of hands. Where do you go first to find information? Which do you learn more from on a daily basis? Again, no surprises here, though it would be interesting to get an age breakdown — or perhaps a breakdown by discipline taught. Of the following, which do you think is most important to success in the 21st century work place? I asked my supervisor if i could get the techno guy at my school to unblock a website so my kids can use blogs in my language arts class. 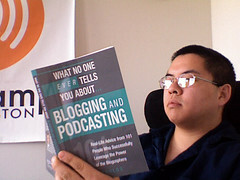 I was told I need to write a letter to the superintendent to explain my justification for using blogs in the classroom. So why should students be blogging in the classroom? Are there other surprise impacts? Please keep it short and sweet, as he’s only been asked for one letter. That statement says a lot, and much of it is arguable. The issues of economic sustainment and growth are far more complex than innovation alone. Yet, most of us agree that in this time of rapid change, prosperity depends on driving that change, not being pulled along behind it. that the United States is losing its innovation edge to China and India. Chinese and Indian children are required to take more science courses than students in the United States, said Mr. Compton. … Of college graduates, 30 percent to 45 percent in India and China have engineering degrees, compared with 5 percent in the United States. Venture financing and patent applications are falling in Europe and the United States and rising in China and India. He continues that 60% of engineering doctorates from U.S. universities are granted to foreign nationals, who are no longer staying in the U.S. “The American economy is not as exciting as China and India, and a lot of them are going back home,” he said. Also worthy of note is that Compton also created, produced, and financed Two Million Minutes, which I’m sure many of you have seen (though I haven’t). Although science, technology, engineering, and mathematics are important/essential, I’m not sure that innovation is the same thing. I think that you can learn to be innovative in English class, history, health, and certainly creative arts. I know I’ve said this before, but to me, and my own limited vocabulary, I think that innovation and creativity are a problem for us, in that they are both much too vague to really wrap instructional/learning activity around. I like the term inventiveness much better, because inventing something attaches the word, invent, to the thing or process that was invented. There’s a hard connection here, that is more difficult to make with innovation and creativity. You can attack problems in virtually all disciplines inventively, and its inventiveness can be judged. Again, STEM subjects are important, but without the ability to apply them within a social, cultural, and physical context leads to knowledge, but not necessarily innovation. And without the skills to talk about them compellingly leaves STEM fairly sterile — to me.